Welcome to the Golden Triangle Minority Business Council! more equitable society by supporting and promoting diversity and inclusion. Good News, The Early Bird Deadline Has Been Extended! 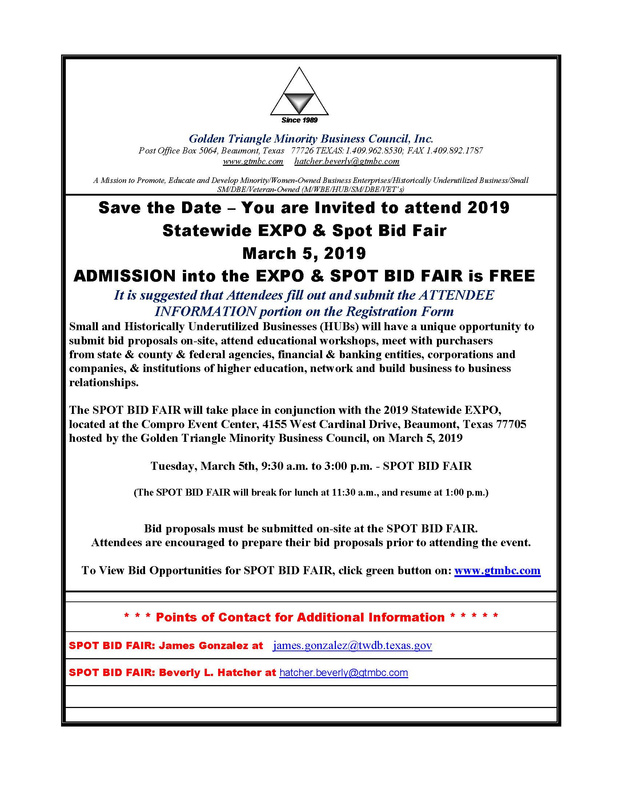 We want to see you March 5th at the 2019 Statewide EXPO & Spot Bid Fair, hosted by the Golden Triangle Minority Business Council --- so we're extending our early bird registration until March 1st to make it easier for you to say YES --- don't miss this opportunity to re-energize your business marketing skills, build relationships, and much much more! Meet you March 5th at the Compro Event Center, 4155 West Cardinal Drive, Beaumont, Texas 77705. Click the blue Registration Now button. 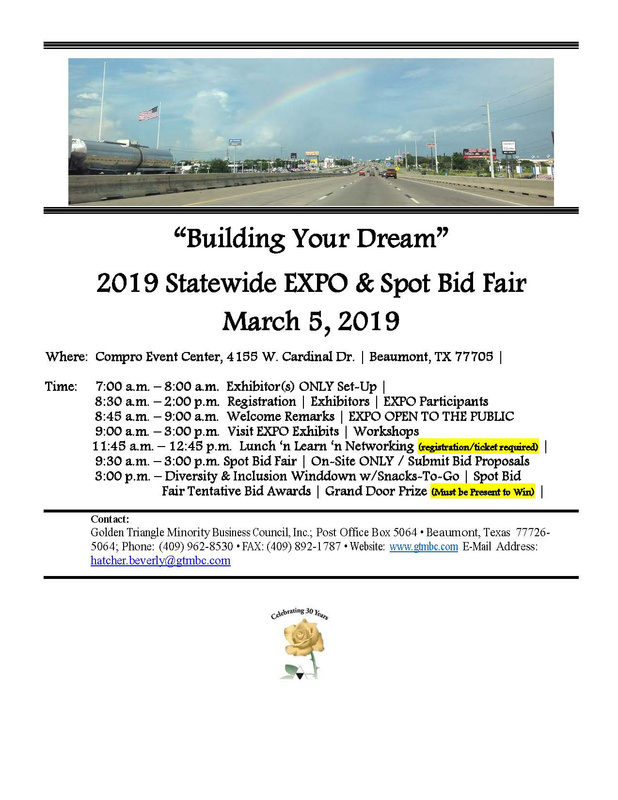 Cardinal Drive, Beaumont, TX 77705, EXPO Doors Open to the Public, beginning at 8:30 a.m.
Click here to view the bid opportunities that have been submitted by State Agencies' and Universities' and Entities for the 2019 Spot Bid Fair. Please know that all bid proposals must be submitted on-site at the Spot Bid Fair by prospective vendor bidders. You are welcome to check this website often because bid opportunities once available will be quickly posted and updated. You will see there are some tremendous opportunities posted, and there will be lots more that will be hand carried in for more on-site opportunities, by many agencies and entities. Your Company must be present to participate. Happy bidding and Good Luck!